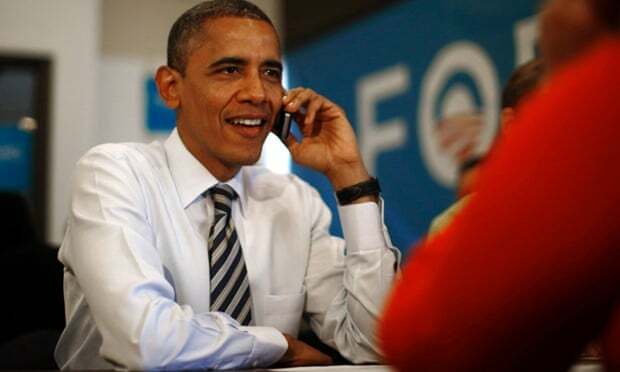 US president says he is banned from having latest smartphones for security reasons - although his daughters have them. President Barack Obama doesn’t send text messages, rarely composes his own tweets, and isn’t allowed to have a smart phone that contains a recording device, he said on Thursday. “I do not physically tweet in general,” the president said in an interview on the ABC program Jimmy Kimmel Live. Obama said his teenage daughters had smart phones and exchanged text messages with their friends, but he was limited for security reasons from having the latest technology. Clinton, the presumed frontrunner for the 2016 presidential nomination, has come under fire for using a private email account for official business during her time as the top US diplomat.